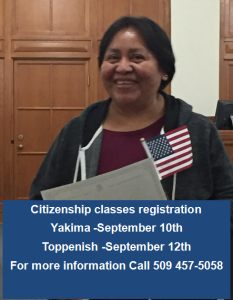 Legal Permanent Residents enroll in Citizenship Education to learn about civic participation and U.S. history in preparation to apply for naturalization. Through the course, students also learn details about the naturalization process. We offer classes quarterly (every 3 months) in Yakima and Toppenish. Each class meets two nights a week per two hours at selected locations in both towns. Citizenship Education has the highest participation rate of all La Casa’s classes. We are able to offer these classes with the assistance of many volunteers and community partners. For more information, call (509) 457-5058 or email mireya@lacasahogar.org.